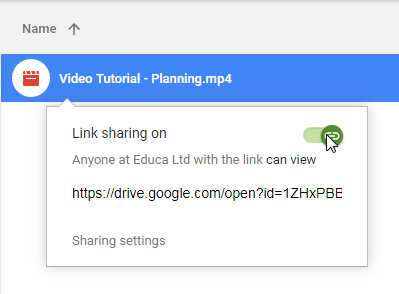 This article explains how to embed a video from Google Drive to your Educa Site. Educa's video upload function allows a maximum file size of 300mb. If your video is larger than that, it will need to be uploaded to a Cloud Storage or Video site such as Google Drive, Dropbox, Vimeo or Youtube. From there it can be embedded into any text box on your Educa site. 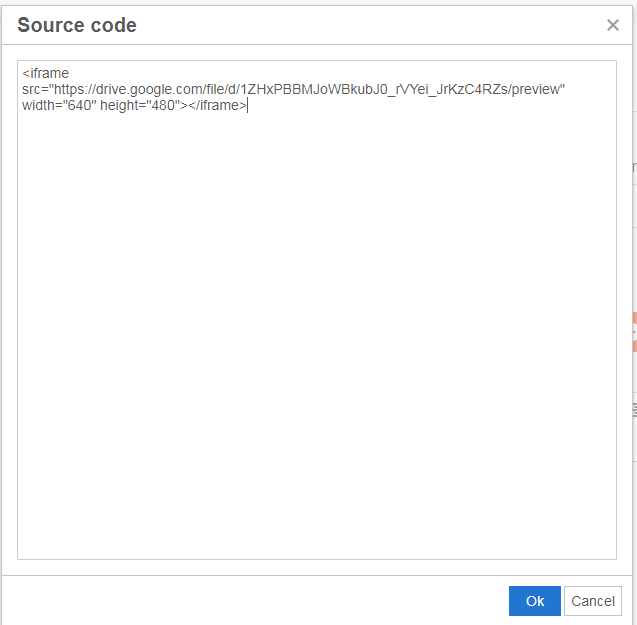 This article will use the example of uploading a video to Google Drive and embedding it into a Message Board post. Note: You will need to have a Google Drive account set up before continuing. Select "New" from the top left corner of the screen, then select "File Upload" from the drop down list. 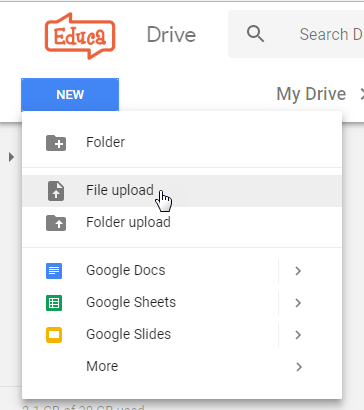 Search for your file, select it and press "Open" to upload the file to Google Drive. The time it takes to upload will depend on the size of your file and your internet's upload speed. 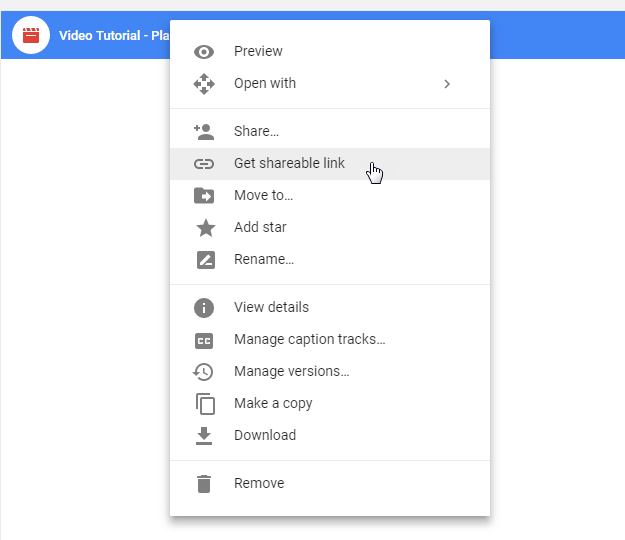 Once your file is uploaded, right click on it and select "Get Shareable Link"
You will now need to set the sharing permissions to allow access to the video. 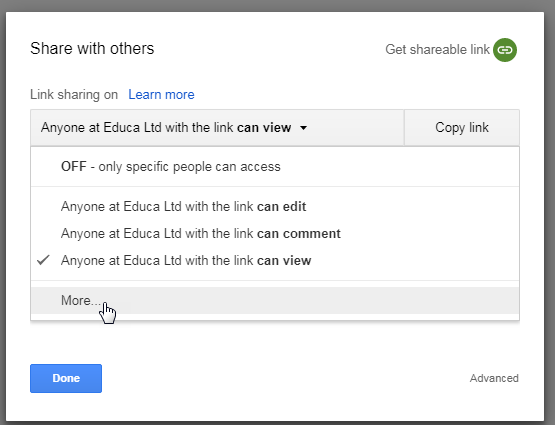 Click the slider next to "Link sharing off" to turn link sharing on. This will be indicated by the slider turning green and the name changing to "Link sharing on"
Once Link sharing is turned on, you need to make it accessible to anyone who has the link, with no sign-in required. This will ensure it plays directly from Educa. 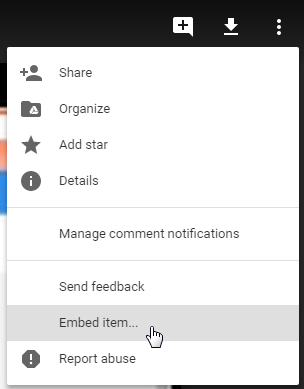 Click "Sharing Settings" from the bottom of the link sharing box shown in the previous step, then select "More ..." from the Link sharing drop down list. Now select "On - Anyone with the link" and click "Save". 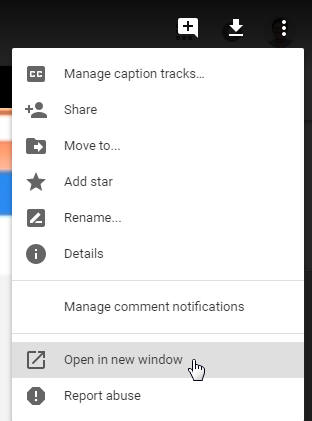 Click "Done" on the previous window to finish setting up the sharing permissions. The nest step is to get the Embedding link. This is what gets copied into Educa. Double click the video to open it, then click the 3 vertical dots (normally located in the top right corner of the screen) and select "Open in New Window"
In the new window that appears, click the 3 vertical dots again and select "Embed Item"
Copy all the text from the pop-up box that appears and click "OK"
You are now ready to embed your video into Educa.  Head to your Educa site and Create a new post. This could be a Children's story, Message Board post, or any other form that includes an editable text box. For this tutorial I will be creating a Message Board post. Paste the text you copied earlier into the Source Code Editor window that appears. If you have already written some text, this will show in the Source Code editor. For easy embedding, just paste the text either directly above or below all the text shown in the Source Code Editor. Click "Update" to complete the embedding process. You have now embedded your video! The embedded video will not show correctly while editing the post, so click "Publish" or "Draft" to check out your newly embedded video.